Sometimes, I start Monday morning off with a 45-minute walk into work, through town, along the river. It stretches the legs and provides a good transition to computer life. This week, though, Monday arrived within a snowstorm, and Don and I both worked until five. Afterwards, we loaded up the cross country skis and drove to the nearest trailhead in the Rattlesnake, where only a few cars were parked. Poaching the last daylight, we headed up to Sawmill Gulch. No wind. Snow falling. Alone on the trail, we set our own fresh tracks. We startled deer more than once. We unloaded our weekday worries, and as the light faded to dark, Don jogged up a hillside to catch a few turns (and a face plant). We never pulled out our headlamps, so it was the texture of snow under skis and the shadows that guided us home. When I was a kid, a snowstorm brought a certain well of excitement. My sister and I would bundle up, often at night, walk out into yard, and play until our fingers and toes went numb. I love the light of a snowy evening, the way dusk hangs late, the silent glide of snow, and how night glows as if from within. 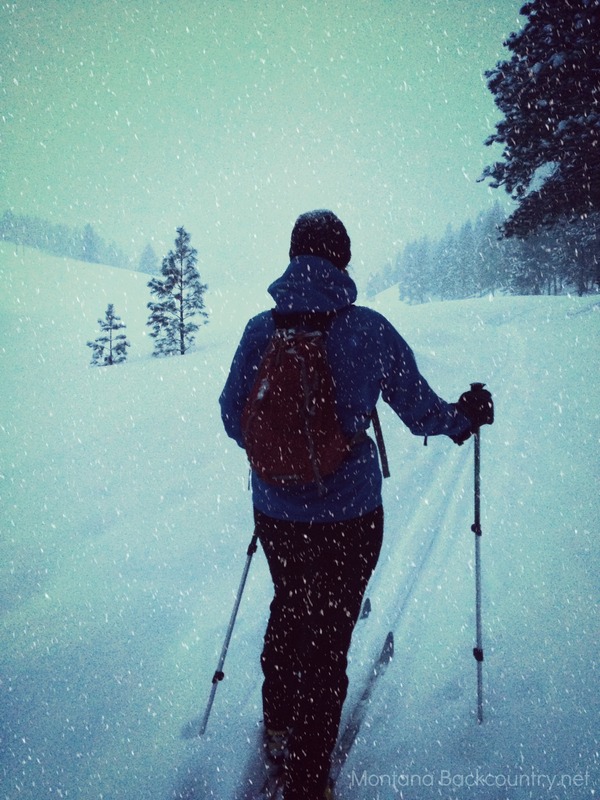 Skiing at night in a storm brings back that same exhilaration, of being out there in it, watching a landscape transform. Indeed. So if you want to get a little exercise, clear the head, put a smile on your face, or just feel like a kid for a few minutes, try an after-work ski.